Slow-Cooker Black-Eyed Pea Dip with Corn and Bacon is a wonderful way to ring in the New Year, but it’s also a favourite game-day food in our home. 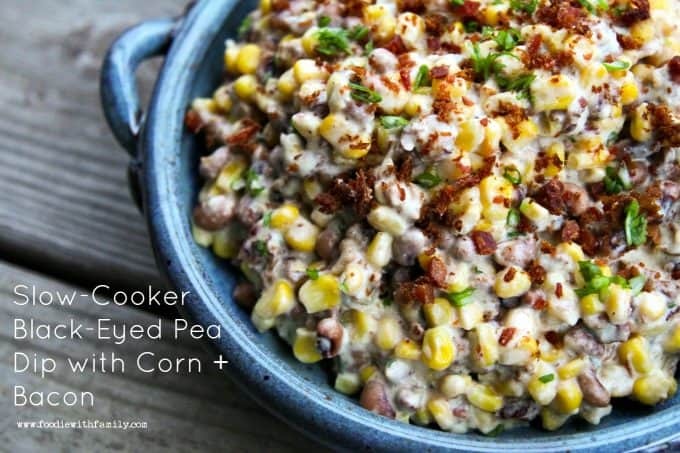 Whenever you make it, it is absolutely BURSTING at the seams with black eyed peas, corn, and bacon in a creamy, slightly spicy cheese sauce. You’re probably familiar with the Southern tradition of eating black-eyed peas on New Year’s Day so I’ll spare the cultural lesson. Being married to a man born well south of the Mason Dixon and being the granddaughter of two very southern grandparents, black-eyed peas are part of my family’s heritage and I don’t mean the Fergalicious variety. We always have one sort of black-eyed pea dip or another for our first day of the New Year; most often Recession Caviar a.k.a. Texas Caviar. This year, however, the annual bowl of chilled black-eyed pea salsa has been dethroned by our new favourite black-eyed pea recipe; Slow-Cooker Black-Eyed Pea dip with Corn + Bacon. Ooooh, mama. This is how you start a new year. This warm dip is absolutely BURSTING at the seams with sweet corn, crispy bacon, buttery textured black-eyed peas, and garlic, all in a creamy sauce of melted Monterey Jack, cream cheese, sour cream, and crushed red pepper flakes, with some minced green onions stirred in at the end for a fresh POP of flavour. Given that you stir everything but the bacon and green onions together at the beginning in a slow-cooker, cover it, and let it go on low for 2 to 3 hours, it’s pretty difficult to think of an easier addition to a New Year’s Eve buffet table or a New Year’s Day brunch or get -together. 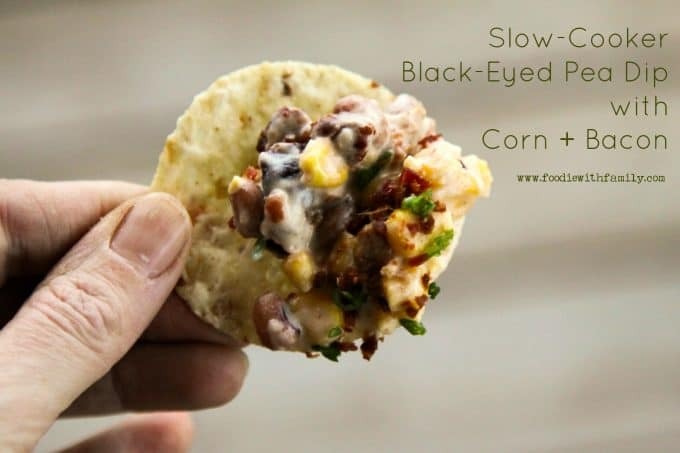 While we love Slow-Cooker Black-Eyed Pea Dip with Corn and Bacon as a dip with tortilla chips or vegetable sticks, it’s equally wonderful as a side dish to any multitude of proteins; grilled, roasted, broiled, or pan-fried pork, chicken, beef, or fish. I use frozen corn for Slow-Cooker Black Eyed Pea Dip with Corn and Bacon, because it’s a darned fine substitute for fresh corn on the cob in Western New York in December. Truth: when I make this in June, I also make it with frozen corn. I find that the frozen corn holds up better structurally than corn shaved from the cob. In short, use frozen corn. 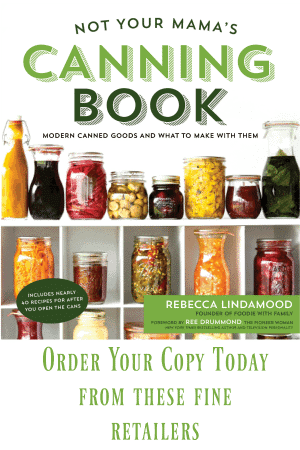 Could you use canned corn? Probably, if you drain it and rinse it, but I haven’t tested it that way! There is absolutely no need to thaw the frozen corn first. You will need to spray the inside of your slow-cooker crock before adding ingredients or you may find your cheese likelier to stick to the crock than the corn. That would be very sad. Not a fan of non-stick cooking spray? Butter it generously. Please note there is a range of measurements given for the crushed red pepper flakes. It probably goes without saying, but I’ll say it anyway: use the lower end of the measurement if you don’t love spicy foods and the higher end of the measurements if you like it spicier. Go somewhere down the middle if you’re unsure. You can always adjust upward on the heat quotient by adding hot sauce to individual servings. After the 2 to 3 hour cooking time is up, you can turn the heat to the “Keep Warm” setting if your slow-cooker is so equipped, for up to 2 hours. Beyond that, you’ll probably want to transfer the contents to a bowl with a tight fitting lid and refrigerate. The leftovers are good for up to 5 days after cooking. 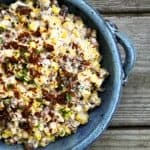 Slow-Cooker Black-Eyed Pea Dip with Corn and Bacon is absolutely BURSTING at the seams with black eyed peas and corn a creamy cheese sauce. Lightly spritz the crock of a slow-cooker with non-stick cooking spray or generously butter it. Stir together the sweet corn, black-eyed peas, cream cheese, Monterey Jack cheese, sour cream, garlic, salt, and crushed red pepper flakes. Put the lid on the slow-cooker and set the cooker to LOW. Cook for 2-3 hours, or until the contents are uniformly hot, the cheese is melted, and the corn and black-eyed peas are coated with a creamy sauce. While the mixture is cooking, finely chop the crispy bacon and reserve 1 tablespoon of the chopped bacon along with 2 teaspoons of the minced green onion. Stir the remaining bacon and green onion into the hot dip then scoop the dip into a serving dish. Sprinkle the reserved bacon and green onion over the top and serve with chips or as a side dish. Leftovers can be stored, tightly wrapped, in the refrigerator for up to 5 days. Reheat covered but vented in a microwave on HIGH until hot all the way through. 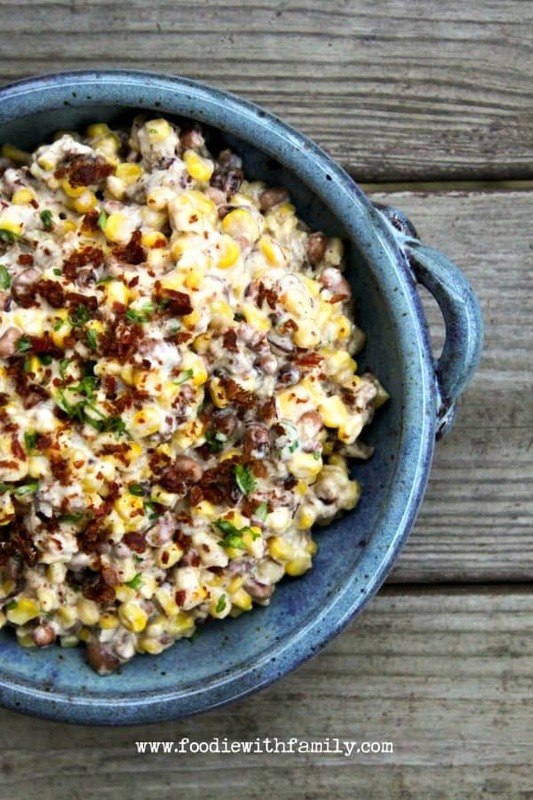 Do you love Slow-Cooker Black-Eyed Pea Dip with Corn and Bacon? You might love these recipes, too! This post was originally published December 29, 2014. Updated with nutritional information and improved notes and tips December 27, 2017. Oh my land, girl!! You know I’m from a southern heritage, too, so it’s black-eye peas every new year’s day, too. Only, we just have boring ones. I’m wishing Stephie and Alex were going to be here, because I’m afraid if I make this for the two of us, we will eat all. of. it. in. one. sitting. And then I’ll have to got buy a new dress for the wedding in a bigger size. Oh, what the heck! I have 4 months to lose the weight. This looks totally worth it!! We had the Slow Cooker Spicy Corn and Bacon Dip on Christmas night. HUGE HIT! Adding the black-eyed peas will definitely enhance it. Plus kick in a little good luck too! Hope your Christmas was merry and your New Year’s prosperous. So I never knew this black eyed pea thing was a THING for New Years. I just learned this last year, how sad right? I’ve been missing out. This dip is exactly how I’d want to have them! It looks amazing! I am a slow-cooker queen. This looks fantastic. I will have to get a bit creative in the substitution because damn Australia doesn’t have half these things but I’m definitely going to try. I love this recipe, perfect for New Years Day snacking!!! Thanks for providing a yummy alternative to our traditional Hoppin’ John. Can not WAIT! I made this for New Year’s Day. WOW!!!!!!! Awesome stuff. I think I will try it with Pepper Jack next time rather than plain Monterey Jack, to amp up the spicy flavor, because we LOVE spicy in my house. It was perfect as is, though, creamy and full of flavor. And yeah, we won’t talk about how much cheese is in there, lol. YUM YUM YUM. Thanks for sharing this recipe, Rebecca! Yeah. I’m making this for our New Year’s party of two! Hooray! You’ll love it. We eat so much of this it’s a little ridiculous, honestly! 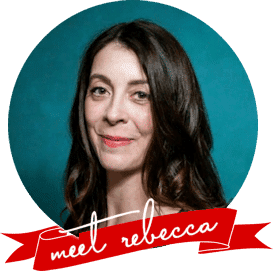 No surprise, Rebecca, that you have developed another winning recipe. This. Is. Fabulous. We are eating it tonight with fresh veggies! Next time, I’m going to give it a go with Pepper Jack! I have never had these but it looks sumptuous. I hope I’m able to get the recipe right when I decide to try it out. Thanks for sharing! I love this! I add a jar of Aldi’s Salsa and that makes it soup, right? Because I could eat it by the bowlful. I’ve left out the bacon (when adding the salsa) and it doesn’t suffer. Taking this to a potluck this afternoon:) I also use 2 bags of frozen corn and 2 bags of frozen black eyed peas instead of canned. I wonder what would happen if I added okra? I’m so glad you like it, Donna! Yes to the salsa making it soup. 🙂 You are my kind of people! While I’m really only a big fan of okra when it’s deep fried, I think it would be a tasty addition, too.